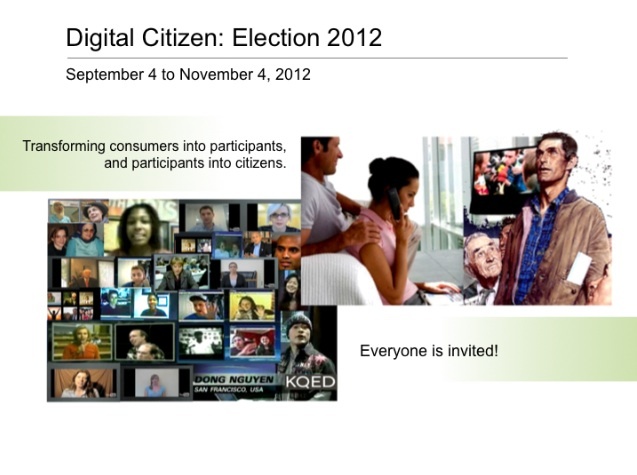 Digital Citizen 2012 is a mobile, online and television project that allows Americans to use personal media to connect with mass media during the 2012 elections. Participants pick the topics that need to be talked about, pose questions for candidates, and choose representatives who best articulate their ideas. When the programs air, the TV studio becomes a nexus of connectivity. Some are here to engage in the live conversation. Some, watching the programs on television, see themselves among the virtual audience of participants, hear themselves speak, and watch as experts consider their comments, and candidates answer their questions. Digital Citizen 2012 aired in September 2012 on Link TV. This is a great idea. Unless you are able to attend a town hall meeting in person, you are not always able to say what’s on your mind and, even then, you can’t necessarily do this on your own terms or on your own time. Feedback and getting questions answered makes sense for the layman in this age of 24-hour news and all-encompassing media. Hopefully, this will get more people involved with what interests them rather than what interests the pundits.